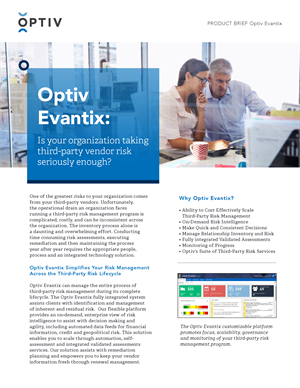 Optiv’s third-party managed service offering allows you to run your vendor risk management program effectively. Using the Optiv Evantix platform, in conjunction with our suite of services, we enable your organization to make quick, consistent decisions and manage the assessment lifecycle of your third-party relationships. Learn about recent changes in the cyber security landscape.